Following the completion of the On The Point redevelopment in Perth, AOM Australia has been featured in The Builders Choice Magazine June 2017 Issue. 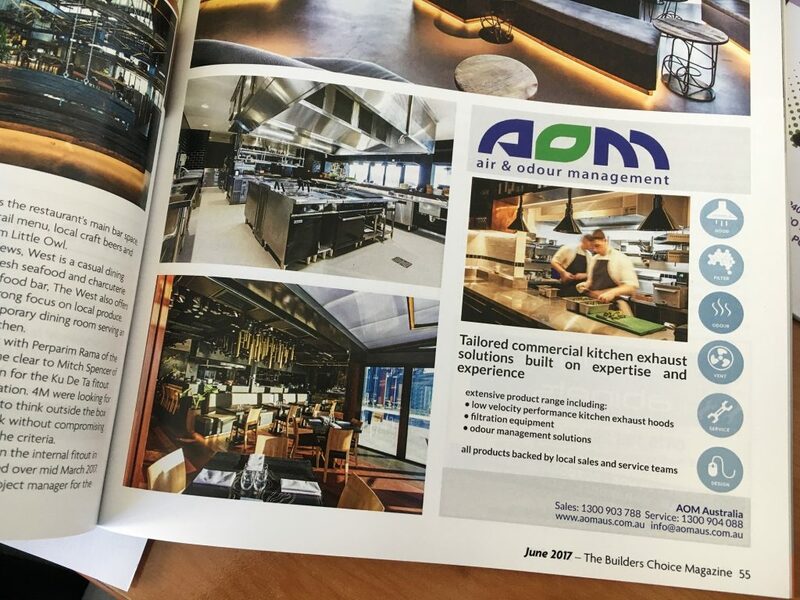 AOM is featured in the Design Ideas section of the magazine where the customisation of the AOM range of kitchen exhaust hoods to any interior design requirement is presented. The magazine also presents two of AOM’s recent projects where HC Series kitchen exhaust hoods with high efficiency filtration were supplied. Both the KuDeTa and the 8 Chinese Restaurant are part of the Point Fraser Development that AOM supplied in full. More information on the AOM range of high efficiency filtration HCFO Series kitchen exhaust hoods can be found on the Product Page. More information on these Point Fraser projects can be found on our Projects Page. The On The Point development as well as the Intercontinental Hotel Perth lead AOM Australia’s expansion in Western Australia. Both sales and servicing resources are now available in Perth. For further questions, please contact our WA Sales Manager.